Added on October 15, 2018 by michael rees. Since the advent of our internet age, Michael Rees has been redefining objects by using digital technology and innovative material to engage contemporary themes and subjects with sculpture. The object serves as the starting point for a rich interactive experience. In this exhibition, he continues to explore materials by using inflatable objects—supplemented with the overlay of augmented reality—to add multiple layers of complex semiotic relationality. Inflatable objects have historically been seen in utopian furniture, architecture, and toys dating back to the 1960s. 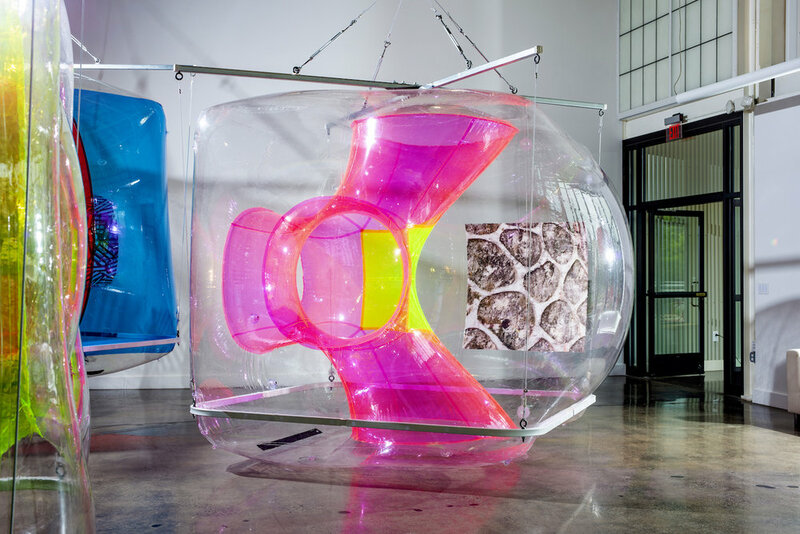 Synthetic Cells is an n-dimensional sculptural project that uses augmented reality and inflatable vinyl sculptures to weave a rich melange around the collision of utopias and an updated 21rst century Chattaqua. Curated by Tom Moran, Rees also conceived of the exhibition as a para-site for artists working with augmented reality to create a show beside the site of the inflatable vinyl cubes. Grounds for Sculpture has invited guest curators Edward Winkelman and Murat Otrbozekov to curate the Para (Site) with 6 artists: Will Pappenheimer, Claudia Hart, Chris Manzione, Tamiko Thiel, Carla Gannis, John Craig Freeman. From the start, Rees imagined this exhibition as a group experience where the sculptural works performed as a site for others' augmented reality experiences. The richness of artists working in augmented reality today and their different approaches would be a kind of Chattaqua in which this diverse and sometimes heady art experiences could be experienced as distinct channels in a single exhibition. It is different than a group show in that it is conceived as worlds within worlds, a multidimensional experience. Works are not organized around sympathetic themes in the exhibition but rather operate as portals to other spaces and experiences. installation view (photo by Ken Ek). 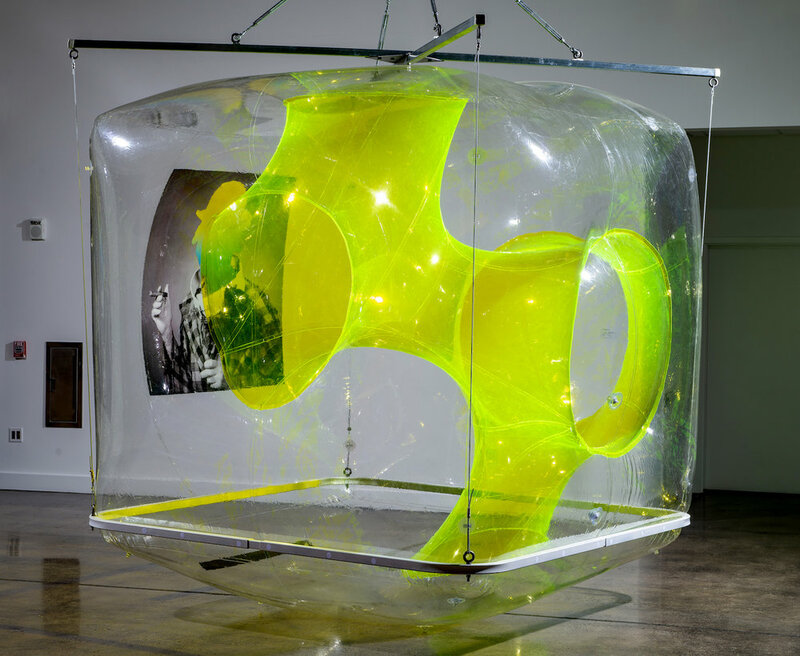 Rees’ work is equal parts science fiction, sculpture, architecture, and philosophy, as he creates multivalent, accessible experiences for viewers of all ages. 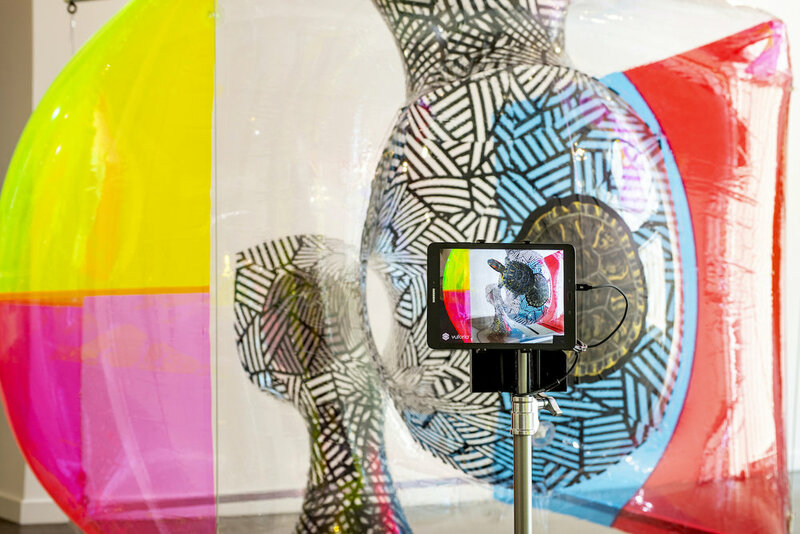 For this project, the artist has created seven 10-foot cube sculptures in varying hues of vinyl as well as augmented reality dioramas of animals and insects, activated by tablet computers that are part of the exhibition. Images applied to the walls and the vinyl skin of five of the seven cubes become triggers for that augmented reality experience. Hovering a tablet device near these images generates a composite view, or augment, for the visitor that overlays the tangible work. 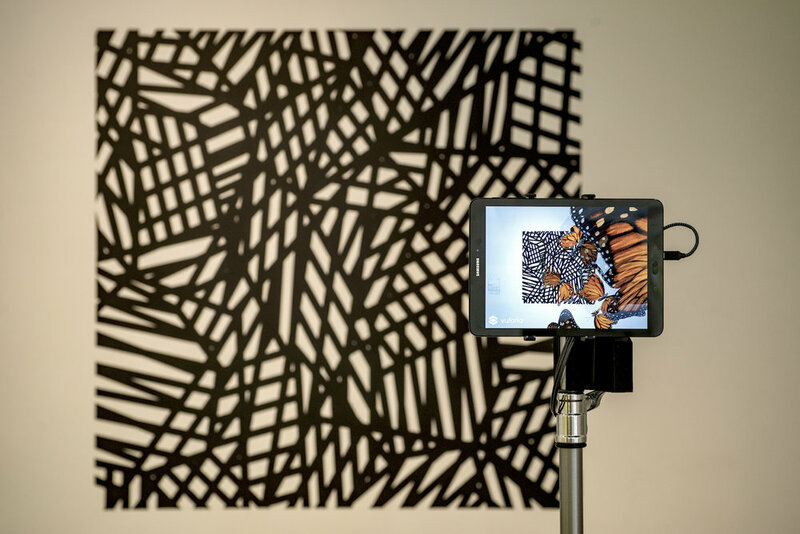 Through the supplied tablet’s viewfinder, the visitor experiences the actual sculpture combined with a computer-generated virtual layer, a collage of the virtual and the real. Rees has described the exhibition as the collision of utopias. 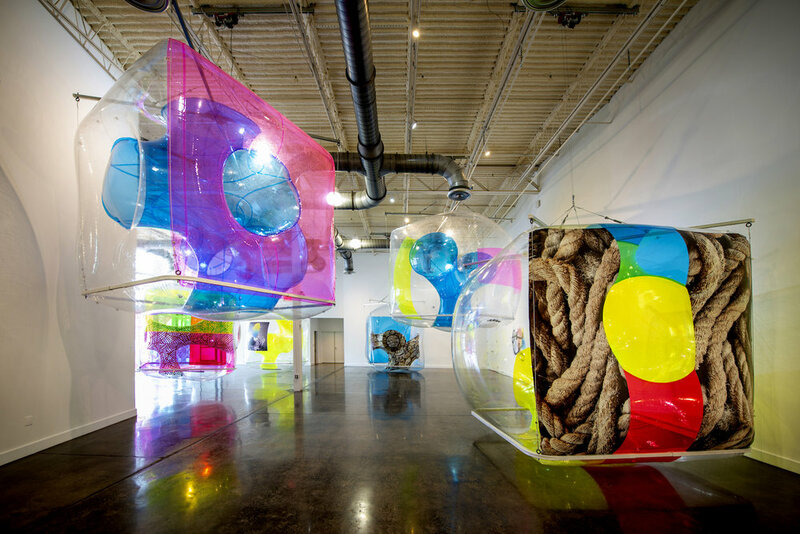 The inflatable designs refer back to earlier 60’s plastic utopias while they are overlaid by a newer utopian scheme, the augmented reality pieces. Synth Cell 006. photo by Ken Ek. From the start, I imagined this exhibition as a group experience where my sculptural works performed as a site for others' augmented reality experiences. The richness of artists working in augmented reality today and their different approaches would be a kind of Chattaqua in which this diverse and sometimes heady art experiences could be experienced as distinct channels in a single exhibition. I think this is different than a group show in that it is conceived as worlds within worlds, a multidimensional experience. Works are not organized around sympathetic themes in the exhibition but rather operate as portals to other spaces and experiences. In my own work, I place strange experiences in a conflicting context to create novel interactions in the mind. These pneumatic structures are open-ended and they change as we move around them. My ideal scenario with the viewer is that we will look together into the theater of my invented space to find what might be there for both of us. Added on October 12, 2018 by michael rees.